Industrial conglomerate United Technologies (NYSE:UTX) will pay a regular quarterly dividend of $0.535 per share on June 17 to the holders of record at the close of business on May 17. Shares will begin trading ex-dividend on May 15. United Technologies, a diversified company that provides high \-technology products and services to the aerospace and building industries worldwide, has paid cash dividends on its stock every year since 1936. 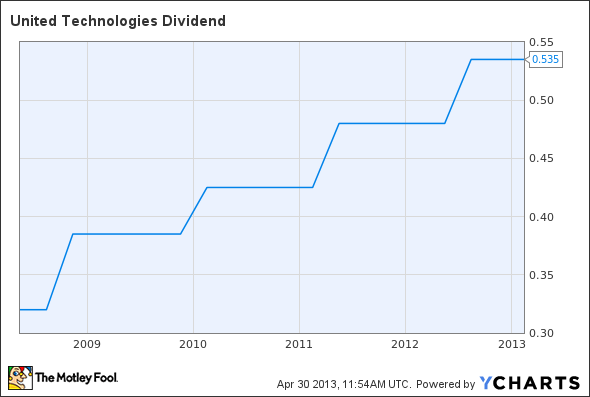 The most recent dividend payment equates to a $2.14-per-share annual dividend yielding 2.3% based on the closing price of United Technologies' stock on April 29.